2).Shift it to the autumn and have a second West Coast "swing": San Francisco, Napa, Palm Desert, Las Vegas. The early season schedule needs room to breathe, Adam Scott presumably just the first to suggest he may not sign up for the two WGC's, Mexico & MatchPlay. Anyway, spreading out the "Big" events on the "Big" tour seems inevitable. 3).But not for this year and there's a decent, but not great, field scheduled to tee off Thursday, though one star attraction, Justin Rose, will be without caddie Mark Fulcher who's undergoing a "minor" (easy for me to say) heart valve procedure and will be replaced by Gareth Lord. Jon Rahm defends his title and he could use a good result - no wins on Tour since then. 4).A bit late for your fantasy game last week, but Charlie Howell played his 18th consecutive Sony Hawaii Open last week; he's made the cut every trip, with 2 x runner ups, 2 x 3rd's, and six other top ten finishes, including T8 last Sunday. Amazing how some pros have fantastic records at certain courses. CHIII goes well in the Desert too, 6 x Top 20's in 13 trips, including the last nine. Tiger signing up (good field with Thomas, Rosey, Rory, Rahm, Rickie & Spieth) to have a go at his 9th pro win in San Diego reminds me that Howell's Hawaii record is not Woodsian, or ever Philian, but everyone knows about their exploits! 5).And, talking of last week, Chez Reavie holed out from 100+ yards for eagle on THREE Par-4's last Friday, apparently the first time that's been done on Tour since 1983 - wonder who that would have been? BDeC, Schauffele, Thomas, Koepka, DJ, Finau, Kuchar, Woodland, Simpson, Cantlay (like him and Hadwin this week). Howell is 11th, Reed 14th, Woods 21st, Mickelson 22nd, Spieth 38th. 7).The web.com season-opener is wrapping up in the Bahamas. Whoever wins, kudos to Morgan Hoffmann who made the cut despite his MD diagnosis. I don't know how he does it, thank goodness, but long may his career last. 8).Talking of which, sort of, long-time MS patient Tony Johnstone must have the most interesting Twitter feed, a wildlife treasure trove, plus all the other good stuff he posts. 9).The Champions Tour tees off in Hawaii - and the news that Gary Nicklaus turned 50 today (16th) makes me feel even older than normal. He'll join fellow PGA Champion sons Dave Stockton & Brent Geiberger striving for Champo Tour sponsor invites. 10).Martin Laird (badly needs some good results) and Russell Knox play this week, but Graeme McDowell takes the week off. Probably not surprising as he hasn't played there for 16 years but relatively short courses with a premium on putting should suit him. Would imagine he, Laird & Seamus Power will all struggle this year, but interested to see how Danny Willett goes. Patrick Cantlay is one of the top men in the field and he seldom wastes a start, but I'm hoping Adam Hadwin, who shot 59 here two years ago, makes a small improvement on his past three trips: 6th, 2nd, 3rd, and gets his just desserts. And he's primed to earn a decent cheque having finished about 13th in the year's first web.com event, a result which should be good for something like $10+K. EDIT: T12 and $13.2K in the bank - a good start to the season for Tarren and he goes again next week, on Sunday! Kwini, Regarding Kuchar, are you familiar with the American Game Show, "Deal or No Deal"
If so, how about simulating a game of DEAL or NEW DEAL, PGATour style In a spoiler box because it is long. Matt Kuchar entered Mayakoba at a late date, and gave his regular PGATour Professional John Wood the week off because it is an international tournament. No other Tour Caddies are available because it is out of the country and expensive place to travel and lodge. Kuchar finds local Caddie El Toucan and GPB tells El Toucan picks one of 132 Briefcases. Background: El Toucan is a family man, living Hand to Mouth in poverty. The expected (average) value of the briefcases is $3800 but only 25 of those cases contain that much money. No other offers will be forthcoming. Not exactly a "course specialist" because they've played this on different courses thru'out his 15 appearances, but Bill Haas has won about 11% of his career earnings at this tournament . . . . . . . . he's been floundering since his Ferrari accident so maybe the Desert Classic will set him straight. I was well on board with your Charlie Howell tip for Hawaii last week. Unfortunately it was for an each way bet to seven places. At least he softened the blow by being in my NLU fantasy team. What is it with Tom Gillis and his social media sh1t-stirring - chip on his shoulder? But I don't understand GPB's Let's Make A Deal either - are you suggesting that a Mexican caddie in poverty is less deserving of a 10% customary "present" than millionaire John Wood? Chance of fog and rain this morning in the Palm Desert - and I think I've got problems sharpening my shovels for 18 - 24 inches of snow incoming . . . . . . . .
EDIT: Play delayed for 30 minutes at all three courses - strange to think fog is evenly dense but there you go. I am suggesting that a Bird in the Hand is worth two in the bush. Kuchar might have offered El Toucan a SURE THING of $3K (or now $5K) rather than the normal Caddie payout bonus structure of 10% for 1st place, 7% for a top 10, and 5% otherwise. and Yes, symbolically, there is a difference between John Wood and El Toucan. A trip to Mayakoba might have cost John Wood 2-3K for Airfare and Hotel. El Toucan is a local. I just can't see why Kuchar wouldn't pay his caddie the usual rate . . . . . . . plus a one-time fee, say $3K. It was Kuchar who got himself into this pickle, he came out smelling like a rose, but now smells like a complete dufus. Still hope he actually forked over the proper fee - like to think the best of people until they absolutely, unequivocally prove to the contrary, and always felt that Kooch was a pretty upstanding guy. But now perhaps not. Jesus guys. You're robin me of my enthusiasm for the thread. Total pig's ear from Martin Laird, from a T21, at worst, to a T90 over his final three holes. Phil still philling it up, minus phour for the day despite a double bogey. Not bad. Rahm & Cejka going nicely, Justin Rose treading water, and the rest of the leading Europeans need lights out on Saturday. Woods in for San Diego, Mickelson sitting his home tournament out. Plus many of the usual suspects. kwinigolfer wrote: Total pig's ear from Martin Laird, from a T21, at worst, to a T90 over his final three holes. Is Cejka the longest serving member from Europe? He seems to have been around for ages. First time I saw him was when I was on the scoreboard at the Dunhill, way back in '95. That's one hell of a long career. Must be, super, in and out of sick bay these days, and still nuts! Rooting for Steve Marino to play today since apparently he is playing with this guy. I believe this is Marino's final start on his MME. Must need something like a solo 2nd to keep his card - making a good fist of it, must be wondering where his form has been. Mickelson sitting out San Diego and reportedly the LA Open at Riviera as well. Not sure whether that is due to the compressed schedule over the coming months, but kinda surprising (especially LA) news. Phil never liked the Torrey South Redesign (Rees Jones) and he got pencil-whipped on the Torrey North redesign. 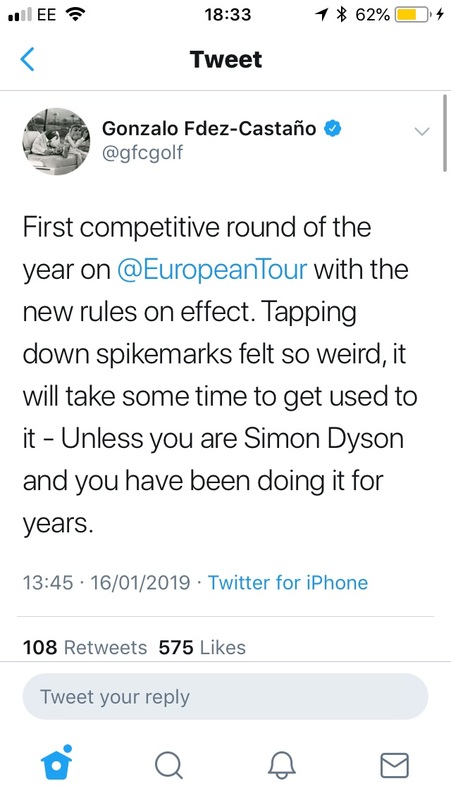 So writing off the Ryder Cup and his home town event because it doesn’t represent the style of golf he likes to play..
What about the US Open Phil? Looks windy and stormy for Round 1 of this week's web.commer in the Bahamas, more than half the morning starters at +3 or (much) worse as they make the turn. But at least they're playing which is more than they'd be doing here #blizzard. Fine round from Russell Knox in the "Desert Classic" yesterday, but most headline attention will be on Phil, and whether he can complete a start-to-finish win. Laird, Willett, Power among those deserting the desert. Good week for Mexico's Ortiz brothers, regardless of whether Carlos improves on his current 12th place in the Desert - brother Alvaro won the Latin America Amateur, thus earning a trip down Magnolia Lane in April. Justin Rose playing well on Sunday until he doubled the 9th; hopefully he can scrounge some owgr bounty with a strong back nine. Whoever you are. Knew nothing about him, but he played like a winner all the way. Being Long matters. He makes it clear that he's "not complaining", but will clearly go through the year with plenty of "regrets", and he's got to get those sponsor obligations in. Anyway, this suggests he'll play the Scottish. In the long run, I wonder if it’s wise to surrender to the NFL? I guess other players face the same challenge as Rickie, with the risk of the 2nd tier tournaments (Colonial etc) getting even more dilluted. Don’t think sponsors will like that. On top of that the PGAT is becoming more and more global, and noone outside the US gives a damn about the NFL. They (we) are basically left with stepping stone golf for 3+ months. pedro wrote: In the long run, I wonder if it’s wise to surrender to the NFL? I guess other players face the same challenge as Rickie, with the risk of the 2nd tier tournaments (Colonial etc) getting even more dilluted. Don’t think sponsors will like that. My thoughts too pedro, somewhat anyway. So much money sloshing around here though that everything at the top becomes very me-first, short-term. More law suits re CTE, and the lustre of the NFL may lose its shine, especially at the feeder school/college level, but it's king of the sporting hill here, tho' not sure why. A few tiers below the galactico level, Brian Davis won the Monday Qualie for San Diego. Must be long odds against him making the cut on these courses, but hope he does. Erik Compton, on his third (at least) heart, just a few years removed from finishing three shots behind Martin Kaymer, US Open winner at Pinehurst. Willy Wilcox, one-time ball-striking machine on the "Big Tour", but quite possibly nuts. John Oda, a likely star of the future, not far behind TJ Vogel & Patrick Reed among Monday Qualie Qualifiers. Ben Taylor the leading GB&I golfer, waddling (don't tell super) along in 30th place. Kaymer won by 8 shots at Pinehurst, Compton and Fowler were 2nd. GPB wrote: Kaymer won by 8 shots at Pinehurst, Compton and Fowler were 2nd. Oh, Phew. Thanks for correcting . . . . . . .
Compton must be right up the top of the list of unlikely/forgotten major runner-ups. David Lynn, Greg Havret, Len Mattiace, Bob May.... some good competition. Didn’t help him today anyway, +11 for the final round. First ever Puerto Rican on tour? I think Campos might do well on Tour, he's had some decent results which, seeing as he's from Puerto Rico, ain't easy. I was surprised at Wilcox falling apart on the back nine. As for Compton (I grew up in the Denis era and he used to be at the same newsagent & pub in his/my later years), throwing in a TEN isn't ever going to help. Really looking forward to the action tomorrow, Dubai as well as SD.